This article is meant to assist you with financial transaction to your accounting system. This is part of the optional add-on tool, called “Advanced Financial Management”. 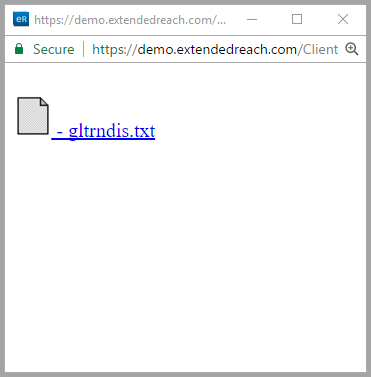 If you are interested in the extendedReach Advanced Financial Management tool, please contact your Agency Administrator, or extendedReach sales. Once the Advanced Financial Management functionality is enabled, Charges, Payments, and Adjustments can be posted to a 3rd party accounting system (such as QuickBooks). Once Posted, these transactions can no longer be modified. (Adjustments be used). These transactions are posted to the accounting system as Journal Transactions. Depending on your accounting system, Journal Transactions associated with an Accounts Receivable Account may be associated with a Customer ID in your accounting system. Journal transactions may either may be posted in a consolidated (by date) format or as individual Journal Entries per transaction. Payments are typically posted to the day of the deposit. You must be an Agency Administrator or Billing Administrator to access “Administration” on the left side of your Workspace. Go to “System Settings”. 1. 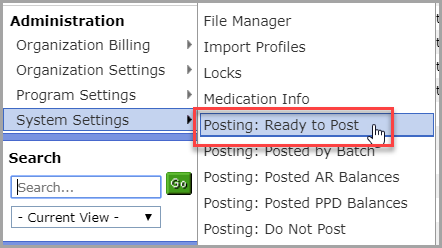 Within System Settings, click on “Posting: Ready to Post”. 2. Click on the “Post” button. 3. Complete the fields and click on Submit. 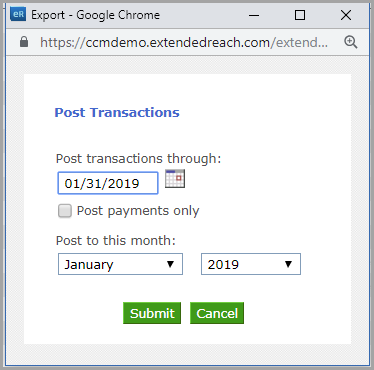 Post transaction through: Click on the calendar icon and indicated the date through which this post will include. 4. This process will produce a file that you can upload to your accounting system. Right-click on the file and choose to Save or Download to your PC. To view post transactions, go to System Settings and click on Posting: Posted by Batch. Each batch is automatically assigned a number and is identified as a Receivables or Payables batch. To Regenerate a batch (re-create the same file) click on the Regenerate Batch button. 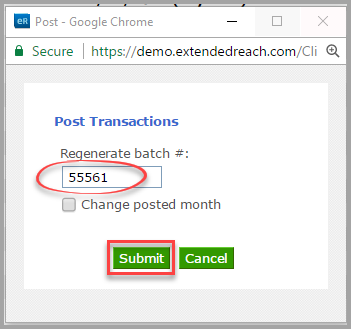 Type in the batch number you wish to re-generate, and click on Submit.